Two each of milk, dark and white chocolate shaped labradors. 63g. 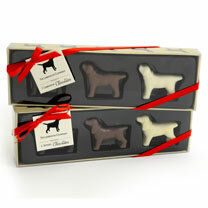 Two each of milk, dark and white chocolate shaped labradors or spaniels. 63g.